A fierce temptation during Mass and thanksgiving to break my resolution and indulge my appetite at breakfast…Jesus urged me to pray for strength though I could scarcely bring myself to do so. But the temptation left me in the refectory, and joy filled my heart with the victory. I see now that I need never yield if only I pray for strength. COMMENT: Fr Doyle wrote this reflection in his diary in September 1913. It is most appropriate for us to consider these words today, the First Sunday of Lent, on which we read in the Gospel an account of Jesus’ temptation in the desert. Jesus is like us in all things but sin. He has been tempted, and not just tempted like us, but with even greater ferocity and power. In today’s quote, and in many other places in his diaries and letters, Fr Doyle speaks of the absolute necessity of trusting in God and seeking his help in moments of temptation. We cannot succeed alone, but we have a God who fully understands the nature of temptation. If we are tempted to give up our Lenten resolutions already, or if we are tempted not to start again if we have already fallen, we should turn with confidence to Christ who understands our weakness and will assist us with his grace. Let us conclude today with these words from Fr Gabriel of St Mary Magdalen OCD, the author of Divine Intimacy, a classic text of Carmelite meditations. 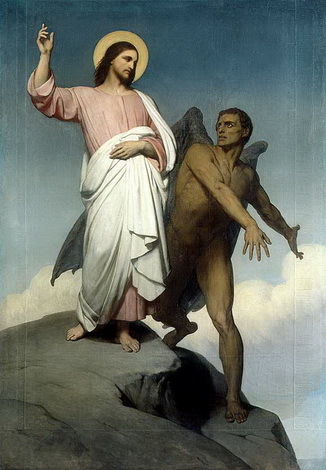 Let us learn from Jesus how to conduct ourselves in temptations. Primarily, He teaches us to have a great confidence in God. Jesus would not satisfy His hunger, nor impress men by means of a brilliant miracle, nor accept kingdoms and wealth because, in a spirit of perfect filial confidence, He had entrusted everything to the Father’s care — His life, His mission, and His glory. Those who will fully trust in God and who rely on His divine Providence, will not be easily enticed by the vain flattery of the devil, the world, or the flesh, because they know that only God can give true blessings and real happiness. We should extend the practice of this confidence to the moment of temptation. If God permits us to be tempted, He does not permit us to be tempted beyond our strength, and, accompanying every temptation, there is always a special actual grace sufficient to overcome it. Therefore, instead of being disturbed by the violence of the struggle, let us use faithfully the grace God always gives and turn to Him in humble, confident prayer. Fr Doyle’ struggle with ‘a fierce temptation during Mass . . .’ reminds me of a powerful scene in a video about the Venerable Matt Talbot, whom you mentioned on the 16th, written by the late Fr Desmond Forristal in 1985 where Matt has an enormous struggle with a temptation not to receive Holy Communion. It was probably a temptation against his faith. It starts at 0.40 into the second part of the video: https://www.youtube.com/watch?v=_vJ76HEUr3s . The first part is here: https://www.youtube.com/watch?v=IT1Yw8J07Rc .The whole programme is less than half an hour and is very inspiring. The dramatic device of Matt walking through the streets of Dublin 60 years after his death and telling his own story works very well. Seamus Forde is superb as Matt.